Superior Quality: Gerolsteiner meets the highest standards set by Germany’s national consumer safety organization for both safety and environmental sustainability. How does Gerolsteiner mineral water fare in the assessment by Stiftung Warentest (consumer safety group) and Öko Test (eco test)? Mineral water from Gerolstein in the Volcanic Eifel is a miracle of nature. 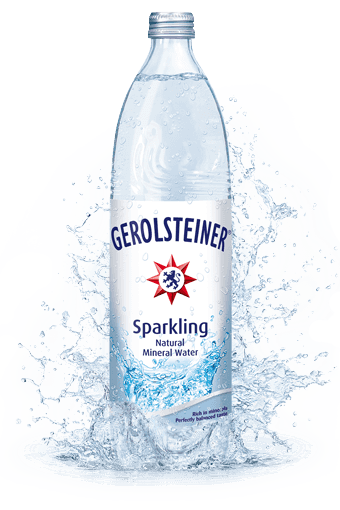 Nature created a unique high-quality mineral water with a natural balanced mineralization – primarily calcium, magnesium and bicarbonate – which gives Gerolsteiner a pleasantly refreshing and clean taste. It’s worth comparing Gerolsteiner with other mineral waters using the Mineral Calculator to see just how special it is! We do everything to protect this miracle of nature. Routine and extensive internal and external inspections ensure that Gerolsteiner’s high quality and original purity remain unchanged from its source to the bottle. We take the utmost care to preserve the unique quality and purity of Gerolsteiner – from source to bottle, so that the mineral water you enjoy is just as nature intended. A comprehensive set of inspections and controls accompanies Gerolsteiner on its path from source to bottle. This begins with regular quality checks on the immaculate condition of the source. Every step within the bottling process is monitored by qualified staff and with the help of the latest technology. Unlike many other water companies, Gerolsteiner has a highly qualified in-house quality assurance team. They conduct over 400 microbiology and chemical analyses daily. Natural mineral water should not contain any substances that may potentially harm people or the environment. Before Gerolsteiner products leave our company, the levels of mineralisation, carbonic acid content, microbiology and many other aspects are rigorously inspected. Our mineral water is tested for over 240 parameters, including but not limited to potential containments like nitrates, heavy metals, polycyclic aromatic hydrocarbons, pesticides and fertilizers, germs or other known harmful substances, such as plasticisers. Our entire physical production process is also tested for possible risk factors and every step in the process is examined very closely. Our team of scientists also focus on research and analyse science studies, technology advances and public discourse that are pertinent to our products so we can continually implement improvements and upgrade our faculties. In addition to our extensive internal laboratory checks, there are regular product inspections by independent third parties, for example, the Fresenius Institute. Other entities inspect glass and PET that come into direct contact with the product to ensure the pristine quality of our mineral water is not compromised. Even selecting the packaging material for our mineral water is important for us. We do not sacrifice quality for economical considerations and use 100% ecologically safe packaging. We offer Gerolsteiner in glass and PET bottles. We only use a new high-quality PET that has acetaldehyde blockers. This means that the acetaldehyde molecules stay bonded to the material and cannot pass into the product. This significantly contributes to the quality and safety of our mineral water. What is bicarbonate? When is a mineral water deemed low in sodium? And where does carbonic acid come from? Learn the terminology of mineral water and our mineral water-based beverages.